I admit I was a bit jealous over the weekend watching everyone’s Instagram posts from Trade Secrets and even worst, the mad rush of finishing RHS Chelsea Flower Show gardens (have you seen photos of Dan Pearson’s garden yet?) I was able to console myself with a trip to Dawes Arboretum and Springfield Antique show with the family. At Dawes, I found a new respect for rhododendrons, which were in full bloom with their rainbow of flowers. Typically you see the pinks and whites, but Dawes had some amazing purples, yellows, reds and oranges. In particular I really liked Rhododendron yakushimanum ‘Yaku Angel’. (sorry only photo I took was of the ID tag). Sunday we went to Springfield Antique Show, and even though it was the last day I was still able to find some good deals. 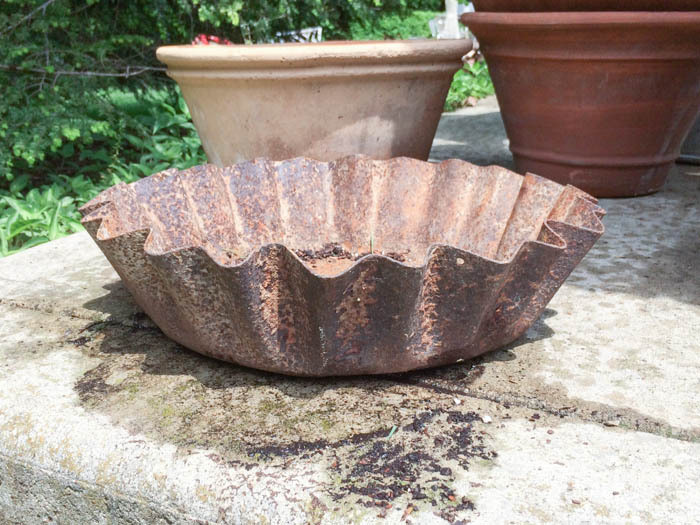 Besides purchasing some plants, I found an assortment of items to add to my ever-growing collection of potential garden containers. I justify buying them with plans to sell to clients, but so far have not be able to part with very many. What I normally purchase are items that had a previous utilitarian life before I transform into a container. Others are unique cast iron garden urns that you don’t see very often, such as my Kramer Brothers urns. Often I get questioned what I am going to do with an item, and only when potted is the vision clear. My current collection of barrels. The smallest (purchased this weekend) is a street cleaner’s rubbish bin. The wider was found at an Amish farm, not sure what they used it for. Finally, I don’t know what the tall narrow barrel was used for, but love the graphic quality of the lettering. These are great pulled together, but each was used for a completely different reason before. 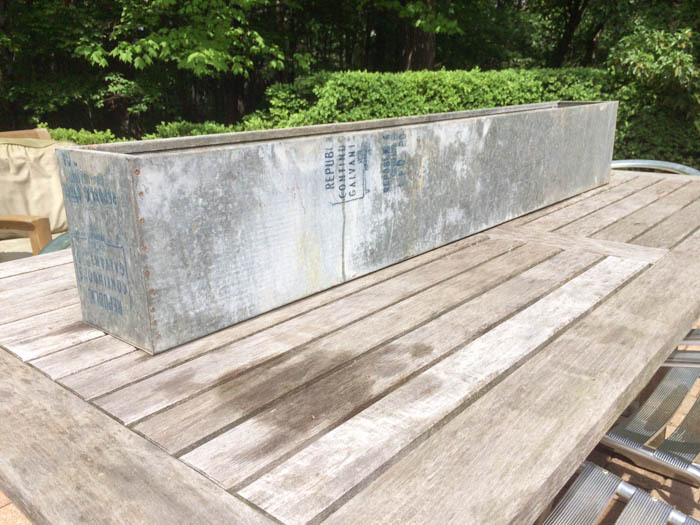 The galvanized feed bin was a purchase last year mainly because it still had the feed label. All these containers have been planted this year with a mix of annuals, perennials and vegetables. I have a pair of these long baskets which I plan to have brackets made and turn into moss lined window baskets. We don’t have a window to use these yet, so will be awhile before get implemented. 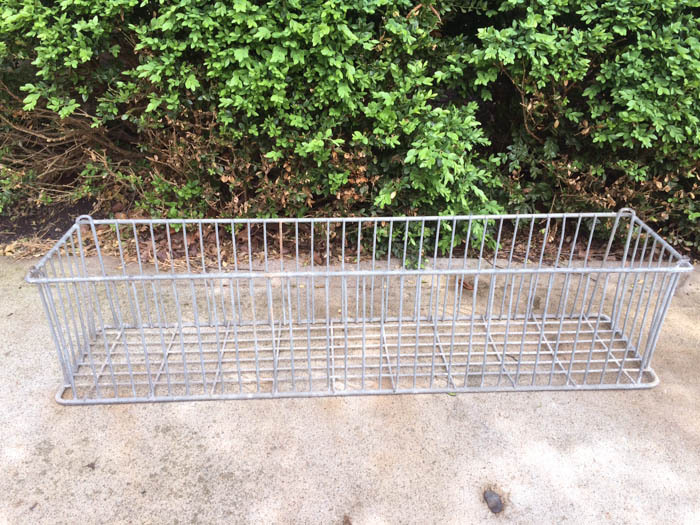 This long galvanized feeder has great crisp edges and is very long. This could be a beverage holder for our next family function, or will be great filled with a selection of herbs. Lots of options with this container. This is a small chicken feeder I purchased because of the crimped edges. The plan was to fill with succulents, but I have not gotten around to it. 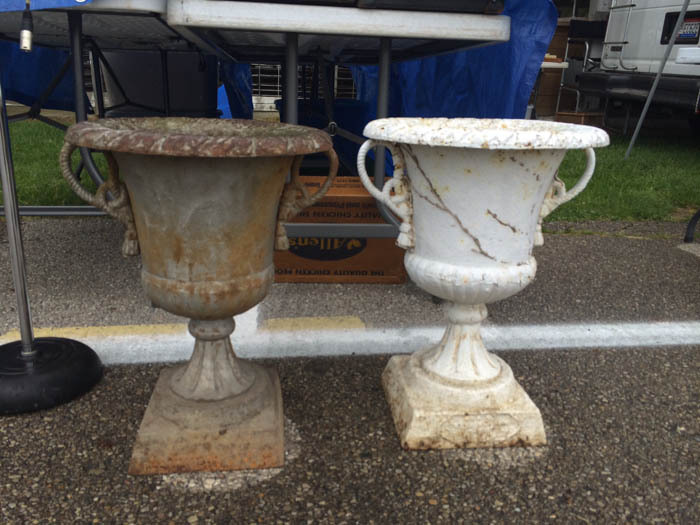 These are a pair of urns that I saw this weekend, but did not purchase. They are a little smaller than I like to use since can only fill with 1-2 plants, but the rope and tassel handles were a great detail. 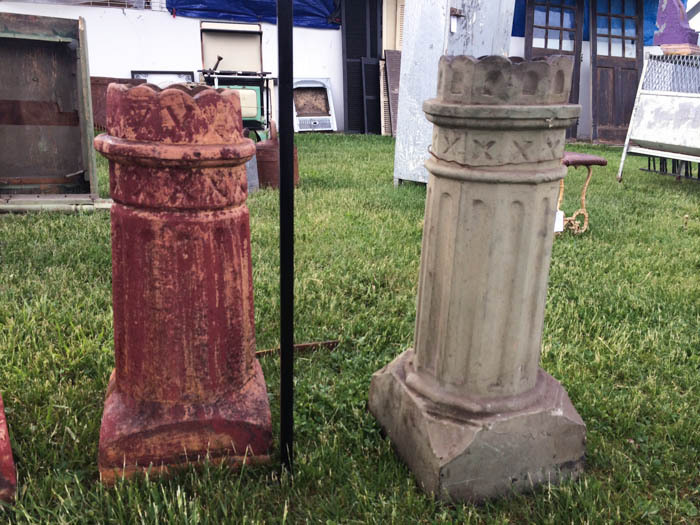 They wanted $350 for the pair, which being cast iron in good condition, is a good price. There was also a booth with a collection of chimney pots or caps (these are just two). I have seen these used in a grouping of containers, flanking doorways and mixed within a perennial bed. I am waiting for find one for a great deal or in a design I have not seen before. For complete disclosure this is just the tip of the collection I have. The majority of our items are in storage while we wait for our house to be built (this has been two years in the making). Once we finally have a permanent home and garden I will have all my containers together and will be able to evaluate what to keep and what to sell. Just with plants, I buy based on emotion and eventually find the container the perfect home. 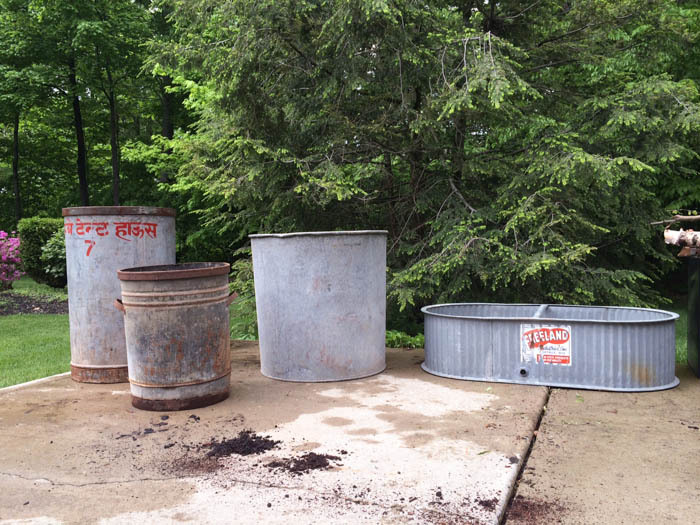 This entry was posted in C O N T A I N E R S and tagged central ohio, containers, galvanized, garden design, landscape decorating, landscape design, planter collections, planter inspiration, Planters by Nick. Bookmark the permalink.